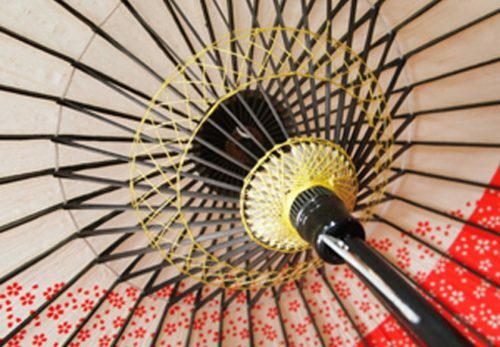 These days, we can enjoy the dance of geiko and maiko at many restaurants while dining. We can appreciate their dance at some events, too. But admission and food can be expensive. 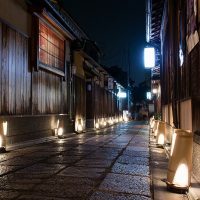 This time, I teach you opportunities where you can see geiko and maiko on the street of hanamachi, along with their life. In the morning, they go to dance and drum practice. 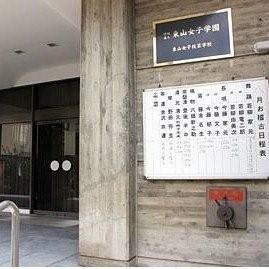 They start making up at around 3:00 P.M.
Banquets are usually divided into earlier banquet and later banquet. Geiko and maiko go to the later banquet at around 8:30 P.M. Many ochaya or tea houses make Sundays a day off. 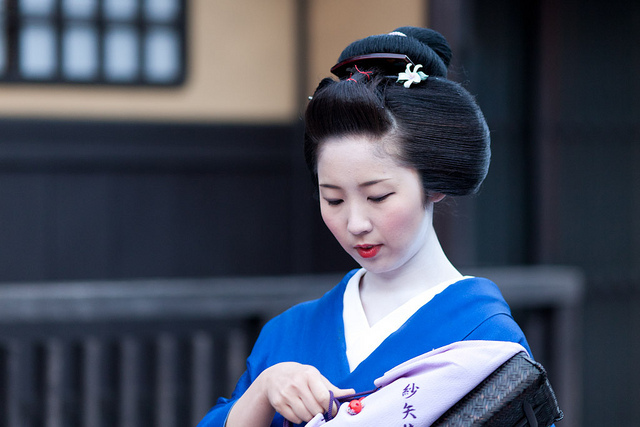 Maiko usually have two days off a month, the second and last Sundays. The rule is different according to each hanamachi, though. What do geiko and maiko do during the daytime? 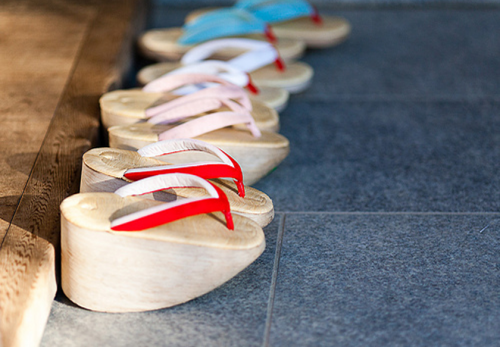 In the morning, they usually go to the school of each hanamachi or dance teacher’s house. 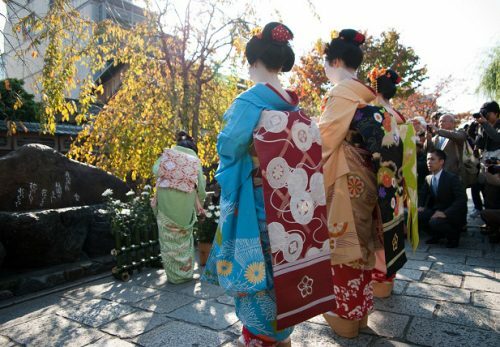 You have a good chance to see geiko and maiko in their usual kimono, not in the costume that is used for the banquet. At each hanamachi,guests show up at the ochaya from around 6:00 P.M.
Geiko and maiko are seen on the street from 5:30 to 6:00 P.M. 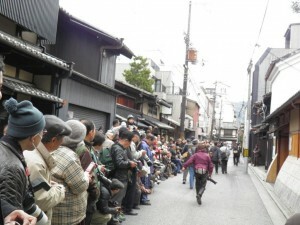 The ochaya is usually not far away from the okiya where they belong. 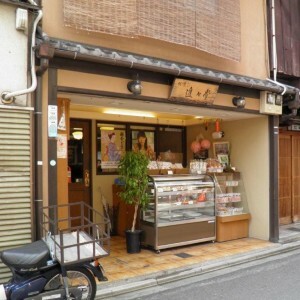 If you stroll around a teahouse of hanamachi at the time, you have a better chance of seeing geiko and maiko. They pass through the noren curtain of the ochaya at a brisk pace. 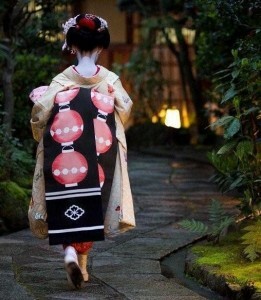 At around 8:30 P.M, geiko and maiko go to the later banquet. 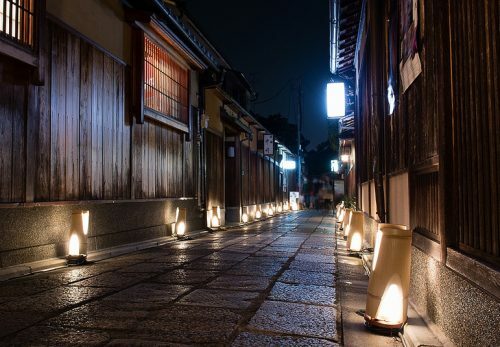 You have the chance to see them walking on the night street. Geiko and maiko seem to have free time between the morning lesson and around 3:00 P.M.
Once in a while, you have the chance to see some maiko relaxing at a neighboring café or shopping at a shop. It is a pleasant scene. 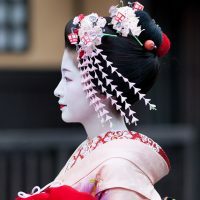 Maiko visit their ochaya on the first and the fifteenth days of every month, although the days are slightly different according to each hanamachi. They usually go to the ochaya at around noon but if they don’t find anyone there, some maiko jot down a memo “I dropped by to say hello.” and put it between the sliding doors. It is touching to see an adorable and polite maiko. I gave all those tips to see maiko because I want to ask you a favor. Do not force them to stop and take photos together, please. You might think taking a photo with one person doesn’t take much time. 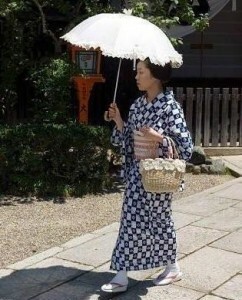 But if that happens, other pedestrians say “Me, too!” “Me, too!” and the maiko might be late for the ozashiki or a lesson. Geiko and maik are young women. When she is surrounded by many people, she must feel fearful. I believe when geiko and maiko walk on the street of hanamachi in a brisk way, you see their professional spirit which is their true aspect. Please watch over them fondly. Do not stop them. 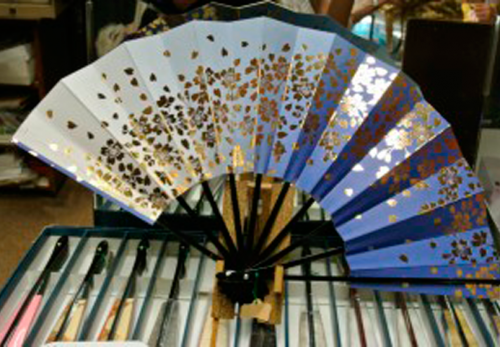 Then you can get a glimpse of the daily life of elegant hanamachi.